MindWare's Most Awarded Game: Qwirkle! Qwirkle is a great game for introducing non-gamers or casual gamers to something a little more strategic, and is fantastic for bringing young players into the fold. There’s been plenty written on this page about that, and I agree with just about all of it. I do have one small problem with it though, and it’s one that the rules book almost addresses… then doesn’t. When playing with more aggressive gamers, it’s very easy to create situations that significantly lock up the board early on, making play incredibly difficult and often “grindy”. Early in the game the first time I played it (which I must admit I waited waaaaay too long for), the other player and I discovered that in a two-player game, by creating an intersection of the same set, it is possible to limit the remaining playable pieces to an incredibly small subset of all the remaining tiles. For example, if the game begins with a row of the blue square, the red square, and the yellow square, the next player can jam the board by placing two other squares of different colors intersecting the red square. This creates a situation where the only legal plays are at the ends of those three-tile lines, and those plays MUST be squares, which by then have likely all been played out from the players’ hands. The game stalemates into a “trade-go” pattern until somebody gets one of the remaining 11 non-red squares from the set of 90-odd tiles still in the bag. Much of the imagery that comes with the game (including the image used on this very page) seems to imply that there should be a consistency to the arrangement of color lines versus shape lines (“colors go East/West, while shapes go North/South”). Human behavior naturally trends towards this gestalt as well, as we’re psychologically hardwired to try to find and create organized structure in things — it’s comforting to us. The rules don’t require us to play this way though, and in fact actually present an example diagram where something like this has happened (http://iloveboardgames.com/wp-content/uploads/2012/02/Qwirkle-Rules.pdf) . The problem lies in getting through the jams when this happens early in the game, and said jams are pretty easy to force. I am always looking for games that I can play with my wife – games that can be played easily with two players, strategic without being intense, and light on theme. Qwirkle fits the bill. Qwirkle is essentially a bag of wooden blocks. Each block has one of six shapes painted in one of six colors. The players take turns laying down tiles, trying to match patterns by either shape or color. Points are scored each round based on how well your block fits into the overall grid. Although the game starts like a casual game of dominoes, it quickly becomes more strategic and rewards you for creative thinking and attention to detail. A lot depends on the luck of the draw, but it works well in this game and can produce a lot of excitement when you draw that one elusive tile! The wooden blocks are of decent quality, though after 100+ games the paint is fading on a few blocks. Sometimes (in a dimly lit room), it can also be frustrating to try and tell the difference between red and orange and blue and purple. The blocks come in a nice cloth bag, so keeping the box becomes optional if there is no room on the game shelf. Overall, I do enjoy this game quite a bit and is one I often grab when trying to spend 30-40 minutes of quality time with family. I would highly recommend it. Qwirkle is very, very simple. Play tiles in a line — those tiles can either share shapes or colors. Add on to existing lines using these rules. Once you’ve “completed” a line with all six of the different colors or shapes, yell “Qwirkle!” and collect twelve points. It scores kinda like Scrabble, where one tile can be used in multiple lines, which adds a nice strategic positioning aspect for point maximization. It’s easy. But…it’s easy for everyone else at the table too. And so begins a nicely-paced, very competitive game where qwirkles are made, blocked, and set up, and the winner is the one with cleverness, foresight, and just a little luck pulling tiles from the bag. Qwirkle is fun, quick, simple, and addictive, and this is immensely helped by the fact that “qwirkle” is just amazingly fun to say. Seriously, try it. Qwirkle. Qwirkle. Qwirkle qwirkle qwirkle qwirkle. There is one minor annoyance that disrupts this otherwise enjoyable little game: the red and orange tiles, especially in low lighting, are often indistinguishable from each other. I imagine that colorblind players will also feel frustrated and annoyed by this game — the color palette of red, green, yellow, blue, purple, and orange will certainly cause problems for those with trouble distinguishing colors. It also caps out at 4 players, which makes it awkward for bigger groups. Ultimately, Qwirkle is a quick, easy, fun game for players of all ages. I can heartily recommend it to those looking for a light gaming experience, especially family gamers. Qwirkle has a very quick and easy setup. Open the box, take out of the bag (which contains the tiles to play with), draw your tiles, and start playing. Each player chooses 6 tiles (without looking at them) from the bag. The player who can play the most tiles in one turn goes first (don’t show anyone else your tiles). After the initial tile(s) are played, each player has to then play tiles that build on those starting tiles (kind of like scrabble- you can’t just play somewhere new, you have to build off of what is already there). To play, you have to lay down tiles that are either all the same color (but different shapes) OR all the same shape (but different colors). You cannot play two of the same tile in the same row. So, if you have 4 circles and 2 of them are blue, you can only use 1 blue circle for that turn. If you play a tile (or tiles) on your turn that completes the set (6 of the same shape or color), you have made a Qwirkle, and you score double! After your turn, draw enough tiles so that you always have six. You continue adding onto the other tiles until one player has no more tiles and there are none left in the bag. The first person to use all their tiles also scores an extra 6 points. There is a little strategy involved to score the most points, but it’s still a relaxing and fun game to play. Since you are only dealing with shapes and colors, it would be easy to teach this game to a wide variety of people. The only issue I’ve noticed is the red and orange can be little difficult to tell apart if you’re not in the right light or you don’t have good eyesight. I’ve heard others say the same about the blue and purple as well. Overall, an easy and fun game to play! 108 blocks, 6 different colors, 6 different shapes. You take 6 blocks, place your blocks to form lines with same color or same shape and score points, double points (12) for a line of 6 (=qwirkle)! Qwirkle has some elements of Scrabble, Domino, Sudoku and Uno in 1 game. Nice wooden blocks and a decent bag, that’s all. Good value. No setup time. Rules are easy and quick to learn. Thumbs up! I’m not a fan of abstract games, but my family likes this game, so I play it often. The turns are quick, you can always do something, game time is perfect. There’s a tactical element (blocking lines), but you need luck to win, certainly with more players. There’s a lot of scorekeeping during the game (every turn). The colors can be difficult to see in low light (blocks are black). No theme (obviously, it’s abstract). Not very innovative, but simple and fun abstract game for young and old. Qwirkle is an abstract strategy game that does what Scrabble did for words, but does it for colors and shapes. Players score points placing colorful blocks in certain positions on their turn. Whoever gets the most points of course wins the game. The rules are simple, and the game is very accessible. Qwirkle is really simple. In the game there are six colors and six shapes, and it comes with three sets of those for total of 108 tiles. The basic gist of the game is that you try to make a “qwirkle” which is six of the same color of different shapes or six of the same shape but different colors. When you make a “qwirkle” you get a bonus six points. This is all done by players taking turns putting down either a single tile or multiple tiles in row that does not violate the color and shape rule. 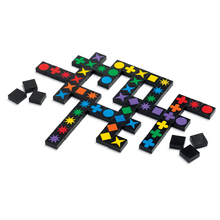 Players then score points for every tile in a valid combination (again, extra for a “qwirkle), and then refresh their hands. Play continues until someone plays their last tile for a six point bonus. Player with the most points wins. This is a really enjoyable game. It’s good change of pace, but might be a tad long for a typical “filler”. The rules are easy enough that even younger kids around six or seven can play unlike say Scrabble where you need to be able to read. This makes for a fun family game. So far almost everyone of my non-gamer family members enjoy it. My wife likes it too, so that’s a plus for me. The components are very nice and comes with a nice drawstring bag that fits all the chunky blocks in it. My only caveat is that the game can drag for people who like to over analyze everything. Overall, I heartily recommend this game to round out your collection. Family Gamer: YES – no brainer, easy to learn and accessible. Simple and engaging is the best two word explanation of Qwirkle. Players have a hand of 6 tiles played in turn to a central area building out like a crossword puzzle. There are 108 tiles in the game with 6 different shapes and colors. A tile must be placed next to a like tile either color or shape. More tiles in the row played scores more points including an extra 6 when the sixth color or shape is played for a “Qwirkle.” Scores are tallied throughout play and totaled once a player is unable to pull more tiles from the bag. Gameplay is great fun for children to develop pattern recognition. The tiles are all solid wood painted black with the six primary and secondary colors on them. They are easy to hold and hide and the colors are bright and easy to differentiate. Tiles are stored in a drawstring sack in the box. This was a simple and excellent choice as it is easy and fun to mix up the tiles and everyone can pass it around the table. There is no theme. It is unimportant to the experience. 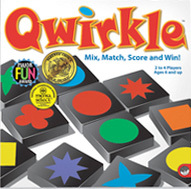 Qwirkle is great for groups of younger kids 6 and up and families with children. Qwirkle is a great game for many different groups of people. If you need a change of pace, Qwirkle fits the bill. If you want something simple to learn but offers some strategy, Qwirkle. If you have a mixture of ages Qwirkle does nicely. Qwirkle has tons of replay because you are drawing from a blind bag and the board is forever changing depending on what the people before you play. Qwirkle has simple rules matching up either colors or shapes, but quite a bit of strategy as you look for the perfect place to play your tiles to maximize your point total. There is also a defensive strategy to block others from cashing in. A game can be played easily with-in 30 minutes so it doesn’t feel like a huge time commitment. We don’t play this one continuously like some family favorites but it is a regular for a break from some of our more involved games like Descent or Axis and Allies. Qwirkle is simple game to learn, yet surprisingly strategic. The game components consist of wooden tiles with various colored shapes painted on them, and a cloth bag to draw the tiles from. During a given turn a player selects one of these tiles randomly and places it down with the other tiles. Points are scored by placing tiles together in groups consisting of the same color or shape. The winner is the player with the most points after all the tiles have been played. Not only is this game fun, it can help young children learn colors, shapes, and pattern recognition. My six year old loves playing this game with his three year old brother. Both of them are able to enjoy this game despite there differences in development. Qwirkle is a great family game, and the casual gamer will enjoy it as well. Just hearing your opponent say “I’ve Qwirkled” followed by your “oooh I’ve qwirkled as well!” makes playing this worthwhile. Easy to learn. You have to lay a number of coloured (six)and shaped titles (six) to earn points. this you do so you are making a connection of colour or maybe shape, but you can’t lay an identical tile (e.g 2 red squares) in the same line. The player doing the scoring is constantly updating each totals each turn but otherwise there is a steady flow. Excellent crafted colourful blocks. Played this with a range of ages. Most people say its like dominos. Not sure why its called Qwirkle, but its a great word! Most people like to express the word in either a sexual context or just plain rude! makes me laugh. good bag, good box & stores the blocks very well. With such a simple concept as this: make a line of either colors or shapes, and no repeats, Qwirkle is a very simple and streamlined game. It only takes about 3 or 4 placements that you immediately see the strategy and challenge of a great game. The scores are tight and the draws can be difficult but this is what makes the game both fun and almost infinitely replayable. Qwirkle is an absolute classic and a game that I will have for an incredibly long time. Add a Review for "Qwirkle"